This shot was taken my first night in Hobart. As I was walking around there was at least four tallships there and they looked awesome in the setting sun. It was a magical evening, walking around the Hobart docks with these ships was like being in a timewarp. You could almost imagine the hustle and bustle of Constitution Docks way back then. I walked around for ages shooting old fishing boats, cray pots and rusty boats. The other thing that was really cool was that everyone was just so friendly and willing to help. Thanks Hobart you were a landscape photographers dream! Has anyone else been down to Hobart at all? Anyone got plans to head down there? 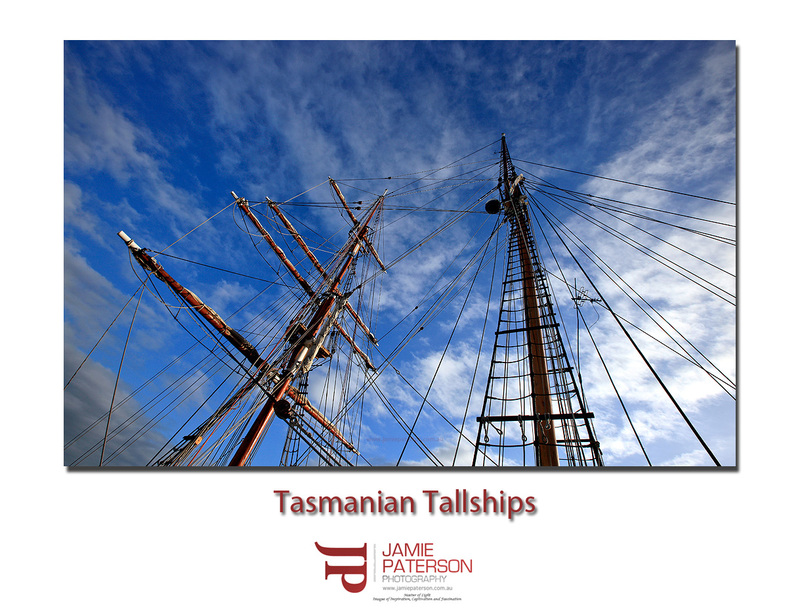 This entry was posted in australian landscape photography and tagged australian landscape photography, constitution dock, hobart, jamie paterson photography, sailing shipts, sullivans cove, tallships, tasmania. I will be in Hobart checking out some ferries I am owner’s rep for at the Austal Ships yard down there, next month. Thanks for that mate. I’m sure you’ve been there heaps of times before but if you haven’t you in for a treat. I just noticed that I am not linked into your blog roll?? Not intentional I assure you. I’ll sort it out. Thanks for the comment mate. I must admit I did tinker with it in black and white last night and it did come up a treat. Thanks for that. It was awesome that day. Have you been to Tassie yet? Its only a short flight for you. cool pov mate. Im with beau on the b&w, just to see how it comes up since it already has a semi abstract feel. i would love to go to tassy and NZ. Both have some great images to be taken! Thanks for the comment mate. I’ll knock up a black and white version this weekend, it would be good to get some feedback on it. I think I could easily spend a month in Tassie and not capture it all. Looking forward to more tassie shots Jamie, I haven’t been yet but (like most places) it is on my list of places to visit. Thank you very much. Rest assured more are on the way. Just had some tricky light situations so its taking a little longer to pump them out. Good to see you made it down there! Hobart has some really cool stuff to shoot from the waterfront area to heaps of convict architecture and then you have Mt Wellington! Hope you got to venture further afield. Thanks for stopping by. I made it to Strahan, Cradle Mountain, Launcestion and then back down to Hobart. I’ll defintely be heading back, probably in very late winter or early spring to capture some snow at Cradle Mountain without facing the worst of winter. I’ll be putting up another Hobart shot tomorrow.